Hosting the only night race on the 2011 Formula 1 grand prix schedule, the premier motor racing league of the world landed in Singapore for the most unique spectacle of the season. Part of an amazing 10-day festival held in the Marina Bay region of the Asian country, 61 laps on the 3.148-mile for the 24 Formula 1 cars is the showcase jewel. Entering the Singapore Grand Prix, World Drivers Championship points leader Sebastian Vettel found himself in an envious position. Building such a monstrous points gap on the changing second place driver throughout the 2011 season, Vettel had a mathematical chance of clinching his second-straight Formula 1 championship with six races remaining. Taking pole in F1 qualifying for the event, Sebastian Vettel was going to make every effort to make the 2011 trophy his by the end of the Singapore night race. On the start of the Singapore Grand Prix, Sebastian Vettel shot to an immediate lead aided by a poor start by fellow Red Bull Racing and front row starter Mark Webber awful launch from the grid. The McLaren-Mercedes car of Jenson Button and Ferrari piloted by Fernando Alonso snaked around Webber before the first corner. While Vettel left competitors behind in both the Singapore Grand Prix and the points standing, a fierce fight for second-place in the 2011 Formula 1 standings. Led by Alonso, 4 drivers were separated by 14 points entering the event. With positions in the event becoming very valuable as the season is entered into its final six races, the fight is less for chasing Sebastian Vettel as it is to prevail for the runner-up spot in driver points. For one contender of the second-place in Formula driver points, Lewis Hamilton's start to the Singapore Grand Prix was a situation the British McLaren wheelman was lucky to escape. Losing 4 positions at the start of the grand prix, Hamilton needed to make an unscheduled pit stop after damaging his front wing when he nudged the Ferrari of Felipe Massa on lap 12. A subsequent visit to the pit road was required by Lewis Hamilton in order to serve a penalty assessed by the Formula 1 stewards. 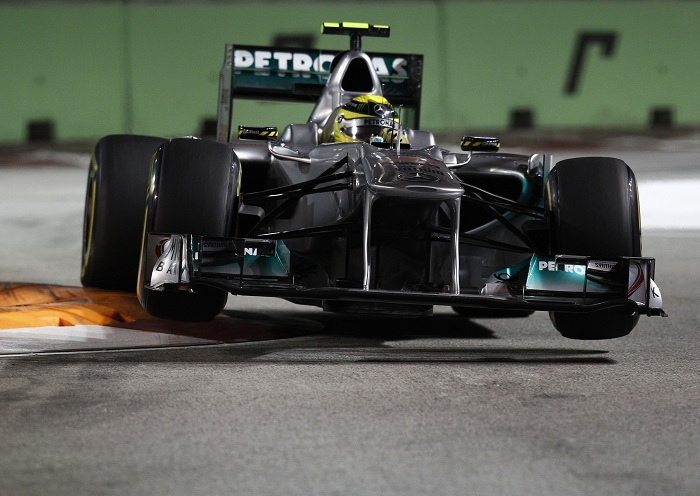 Running as far back as 19th place, Hamilton spent the rest of the 2011 Singapore Grand Prix making a mad dash back to the front. Lewis Hamilton would crack into 5th place in the final race results to redeem this reputation on the track at Singapore. A rather twisty street course, the combination of fast speeds and the 61 laps of competition tested the Formula 1 drivers. For the seven-time champion Michael Schumacher, his race ended through an act of miscalculation. On lap 28, the Mercedes GP driver was setting up a pass on the Sauber-Ferrari of Sergio Perez only to collide with the Mexican. Catching the rear of the Sauber car, Schumacher's Mercedes GP car was launched partially airborne before crashing into a turn 8 wall. The German Formula 1 world champion was unhurt from the race climbing out of his wrecked race car while a safety car took control of the race. In a post race debrief, Michael Schumacher commented, "What happened was what I would call a misunderstanding between Sergio Perez and myself. He was about to go inside and lifted, and I was not expecting him to do that so early, and therefore hit him." In the case of Mark Webber, the Red Bull Racing pilot rose to the occasion alongside Hamilton in claiming a competitive edge. Charting a course back into a potential podium after the safety car period ended, Webber used this Renault power to sail past Fernando Alonso's Ferrari for third place. While so many Formula 1 drivers struggled to gain something through the Singapore Grand Prix, the race fell to the Red Bull-Renault driver Sebastian Vettel who held on to his pole position advantage to take the race victory. His 9th victory of the 2011 season, Vettel finished 1.7 seconds ahead of Jenson Button's McLaren-Mercedes. Mark Webber took the final podium spot for the 2011 Singapore Grand Prix returning to form after a retirement in the previous Italian Grand Prix. 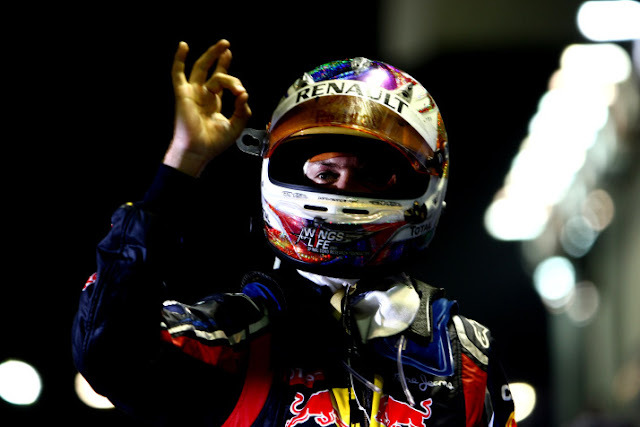 Collecting maximum points with his Singapore win, Sebastian Vettel found himself just short of solidifying his 2011 Formula 1 drivers title. Holding 309 points total and a 124-point lead over second place Jenson Button after Singapore, Vettel needs only a single point in one of the final five grand prix races to clinch the driver's world championship. Formula 1 engines run for the next time on October 9th for the Japanese Grand Prix at Suzuka.